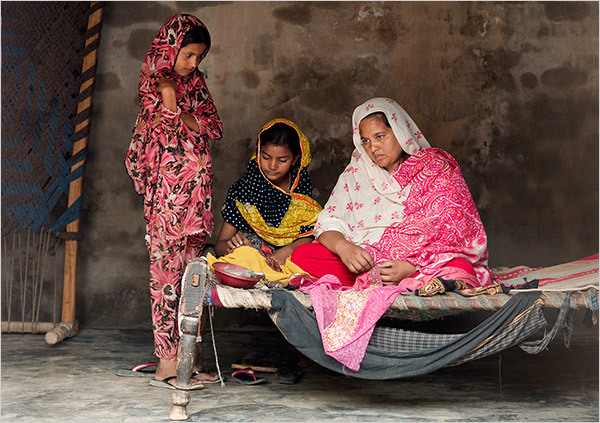 Imagine if women in developing countries had more money and more education and more power. We would live in a world where disagreements would be settled diplomatically (not by the ravages of war), children would be educated and fed (not sold into slavery), and communities would flourish – regardless of religion or political beliefs. Change is happening with micro-loan operations. Nicholas D. Kristof is a New York Times Op-Ed columnist and Sheryl WuDunn is a former Times correspondent who works in finance and philanthropy. This essay is adapted from their book “Half the Sky: Turning Oppression Into Opportunity for Women Worldwide,” which will be published next month by Alfred A. Knopf. You can learn more about “Half the Sky” at nytimes.com/ontheground. 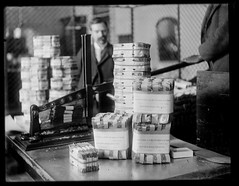 PBS’s Frontline program Ten Trillion and Counting, sheds light on the enormity of our the national debt. In 2001 – when Bush took office, there was a surplus. Then 911 happened, they took us to war, then proceeded to borrow billions to pay for the war, while cutting taxes. His actions served himself and his administration politically, and not the country economically. I would have gladly paid more taxes, to keep us out of the mess we’re in now. They never reckoned where the money would come from to pay back the borrowed billions. During the 8 years George Bush was in office, the amount of the national debt doubled. On the day of President Obama’s inauguration the national deficit was $10,626,877,048,913.08. By the time he leaves office (if he’s in for 8 years) it will have tripled. Fortunately, we have designers, developers and artists who can help us picture the incomprehensible. Mint.com created visualizations of 1 Trillion dollars, using examples to show how much the money is worth, such as “one trillion dollars can pay an additional 11 weeks of vacation for every American worker.” And here’s another that uses Google sketch that shows the physical scale of the actual dollars. Chris Jordan is making some great images which visualize a specific quantity of consumables such as fifteen million sheets of office paper (five minutes of paper use); 106,000 aluminum cans (thirty seconds of can consumption). I cannot comprehend Obama’s $775 billion stimulus package, and budget proposals that, if carried out, would produce a staggering $9.3 trillion in total deficits over the next 10 years. As much as I want to believe that Obama is doing the right thing, those numbers really scare me. How can we feed the beast, when we owe so much? Who’s gonna pay for all of this, when so much wealth has been lost and squandered already? Dwayne just sent me this article on rollingstone.com. It’s takes a good loooonngg look at what how we got into this economic mess and puts in layman’s terms. Well… layman rollingstone reader’s terms – calling Cassano – the guy who headed up the AIG financial derivatives division a “… just a greedy little turd with a knack for selective accounting who ran his scam right out in the open, thanks to Washington’s deregulation of the Wall Street casino.” The Big Takeover is a must read. Can you remember a time when a presidential candidate inspired art? Artists, designers, illustrators, are creating an incredible body of work. I came across this blog today that captures the Obama art movement. It’s called the Obama Art Report. Obama imagery is showing up in the strangest of places. Last weekend, Dwayne and I went bowling at Sea Bowl in Pacifica. 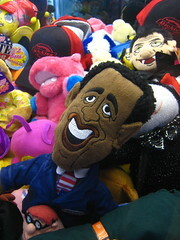 On the way out I spotted Plush Obama in in an arcade game.